The creators of Tails and Tactics, an "exciting upcoming collectible trading card game with guns, puns, bazookas, tanks, and hot dogs," have turned to Kickstarter to make it a reality. The trading card game, conceived by Reynard Loustaunau in October 2011, and with “Jan” of the Swords and Sausages and College Catastrophe online comic strips as Lead Artist, has undergone extensive play-testing with dozens of cards. Now the creators hope to get the funding to start professional printing by the end of 2012. 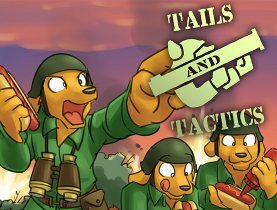 Tails and Tactics is a collectible trading card game featuring dozens of funny-animal modern (or pre-Soviet breakup) soldiers in humorous military situations. There will be Soldier Cards, Troop Cards, Vehicle Cards, Position Cards, Field Cards, Equipment Cards, Event Cards, and Trap Cards. The sample cards show the American and Russian (Soviet) funny-animal soldiers to be mostly dogs of different breeds, with occasional horses, foxes, and others. As usual, several rewards are available, including signed decks and rare or custom cards. We've gotten some much better numbers from different printers and we can print for less money now! In addition, we can print a smaller number of decks and print with less money than our full goal was here on KickStarter. They're a quarter of the way there; $2,543 raised from 35 backers with 46 days to go. Guess there wasn't enough knots to tie people's interest? Well, as it wasn't a pornographic game, I'm not sure how that comment applies? Either way, the IndieGoGo DID raise enough and we'll be debuting the game at AC 2013! I know it isn't pornographic, that was the joke I believe (six months later so could be wrong). It was a jibe at furry's monetary habits going toward things with knots rather then those that do not have knots. Congrats on raising enough, though, it's good to hear, and makes the joke moot.